The Simulink® Scope Viewer and Floating Scope block display time domain signals with respect to simulation time. The Scope Viewer and Floating Scope block have the same functionality as the Scope block, but they are not connected to signal lines. Use the button to add and display signals on a Floating Scope or Scope Viewer. Multiple y-axes (displays) — Display multiple y-axes with multiple input ports. All the y-axes have a common time range on the x-axis. Multiple signals — Show multiple signals on the same y-axis (display) from one or more input ports. Display data after simulation — If a scope is closed at the start of a simulation, scope data is still written to the scope during the simulation. 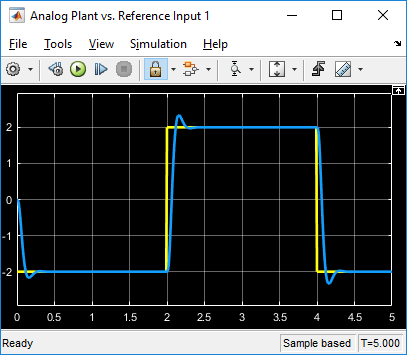 If you open the scope after a simulation, the scope displays simulation results for input signals. Triggers — Set triggers on repeating signals and pause the display when events occur. You must have a Simscape™ or DSP System Toolbox™ license to use the Peak Finder, Bilevel Measurements, and Signal Statistics. For information on controlling a Floating Scope block from the command line, see Control Scope Blocks Programmatically in the Simulink documentation. 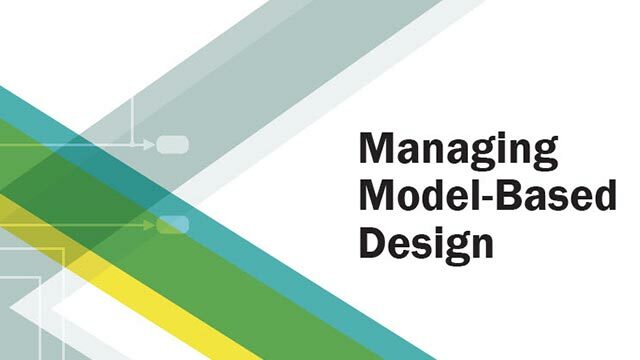 When you use model configuration parameters that optimize the simulation, such as Signal storage reuse and Block reduction, Simulink eliminates storage for some signals during simulation. You are unable to apply a Floating Scope to these eliminated signals. To work around this issue, configure an eliminated signal as a test point. You can then apply a Floating Scope to the signal regardless of optimization settings. To configure test points, see Test Points. If you step back the simulation after adding or removing a signal, the Floating Scope clears the existing data. New data does not appear until the simulation steps forward again. When connected to a constant signal, the Scope Viewer plots a single point. Simulink messages are not supported for Floating Scope block and Scope Viewer. You cannot connect signals from ForEach subsystems. Data type — Any data type that Simulink supports. See Data Types Supported by Simulink. Dimension — Scalar, one dimensional (vector), two dimensional (matrix), or multidimensional (array). Display multiple channels within one signal depending on the dimension. See Signal Dimensions and Determine Output Signal Dimensions. Specify number and arrangement of displays. To expand the layout grid beyond 4 by 4, click within the dialog box and drag. The maximum layout is 16 rows by 16 columns. If the number of displays is equal to the number of ports, signals from each port appear on separate displays. If the number of displays is less than the number of ports, signals from additional ports appear on the last display. For layouts with multiple columns and rows, ports are mapped down and then across. Elements as channels (sample based) — Process each element as a unique sample. Columns as channels (frame based) — Process signal values in a column as a group of values from multiple time intervals. Frame-based processing is available only with discrete input signals. Auto — If Title and Y-label properties are not specified, maximize all plots. On — Maximize all plots. Values in Title and Y-label are hidden. Off — Do not maximize plots. Limit buffered data values before plotting and saving signals. Data values are from the end of a simulation. To use this property, you must also specify the number of data values by entering a positive integer in the text box. On — Specify the number of data values saved for each signal (5000 by default). If the signal is frame-based, the number of buffered data values is the specified number of data values multiplied by the frame size. 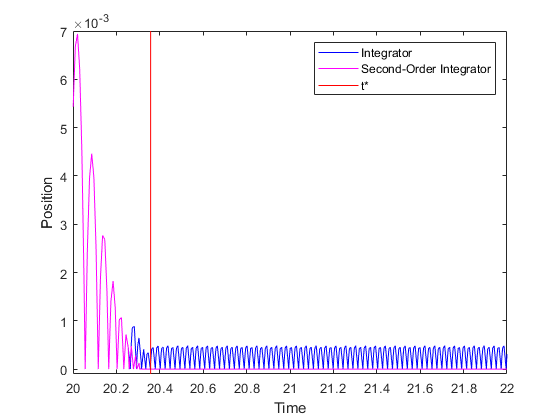 For simulations with Stop time set to inf, consider selecting Limit data points to last. Sometimes, selecting this parameter cause signals to be plotted for less than the entire time range of a simulation. For example, where the sample time is small. If a scope plots a portion of your signals, consider increasing the number of data values the simulation saves. Off — Save and plot all data values. Clearing Limit data points to last can cause an out-of-memory error for simulations that generate a large amount of data or for systems without enough available memory. To enable this property, select Log data to workspace. On — Plot and log (save) scope data every Nth data point, where N is the decimation factor entered in the text box. The default decimation factor is 2. A value of 1 buffers all data values. For signals selected with the Signal Selector, clicking this button toggles the state of the Log signal data check boxes in the Signals Properties dialog boxes. The Axes Scaling Properties dialog controls the axes limits of the scope. To open the Axes Scaling properties, in the scope menu, select Tools > Axes Scaling > Axes Scaling Properties.